You’ll be aware by now, I hope, that I’m quite the fan of a locked room murder. That quantal aspect of something that can’t have happened but nevertheless did tickles me greater the more I read, and so the republication of anything from the classic era is always a cause for celebration. The British Library continue their excellent Crime Classics series with this, their first impossible crime, in which elderly spinster Mary Gregor is found dead in her locked and bolted bedroom (a nice touch with the door lock forestalls the prospect of jiggery, and indeed pokery, there) with no sign of a weapon and the blow that killed her containing the scale from a herring and so stirring up superstitious rumours of merman-like ‘swimmers’ finding their way in to dispatch her. 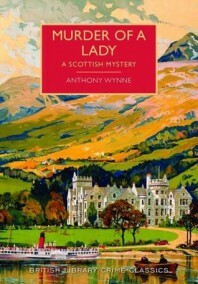 On the spot is Dr. Eustace Hailey, who by his reputation appears to be Wynne’s incumbent amateur sleuth, and so he is pulled into a Highland mystery at a gloomy old ancestral home that ends up the scene of plenty of mysterious comings and goings, clandestine meetings, false leads, and several further seemingly-impossible deaths. Obviously we know he’ll solve it in time, but who will be left to act as a suspect as the dramatis personae gets whittled down and down? Sometimes, as Noah Stewart recently pointed out, an aspect of a book strikes you and you can’t get it out of your head. With me and Murder of a Lady it was the characterisation that I struggled to get past, and this doubtless slightly affected my enjoyment of this book. For example, the dead woman’s brother and laird of the castle, Hamish Gregor, is presented as a closed-minded man who is too deeply mired in the expectations of the Highland Folk to really elicit any sympathy, and yet we are expected to side against Inspector Dundas when he is not sympathetic towards him or his outmoded traditions, the narrow-minded oaf. Conversely, the theatrical, hale, bumptious Inspector Barley is a Grade A irritant yet Hailey is (and so, by analog, we the reader are expected to be) impressed by him when he goes about things in pretty much the same style that Dundas is derided for just with more pompous foreign quotations and greater loquaciousness. Frankly, this bothered me. The fact that the other characters behave in a very believable manner – and Mary Gregor is brought startlingly to life in her absence, bringing to mind the treatment of the victim in Agatha Christie’s Ordeal by Innocence (1958) – is both a credit to Wynne’s clear imagining of his diverse cast and also one of the stumbling blocks the narrative faces. It feels at times that it takes bloody ages to get everyone to a point where they agree on something Hailey figured out quickly for himself 20 pages earlier – while a lot of “Oh, yes, of course my good man, we’ll accept that without further question” wouldn’t ring true (points Wynne) I was often four chapters on before it occurred to me that they were still clearing up some minor point which is already established. But, then, this might just be my problem. This is mainly a classically-styled piece of rococo detection, though, with the mystery being the heart of everything, and so commend itself to those of you who like plenty or red herrings and multiple interpretations for otherwise-blameless acts, even if the answer does then rather come out of nowhere. The method itself is probably fine – and there are a couple of nice false solutions along the way – but I wasn’t completely convinced by its repeated success (there’s one rather key factor in the first two cases which leaves a little too much to chance). However, I’ve accepted and forgiven less likely schemes and, to be honest, I think I’m mainly down on it because of another issue I have, this time with the clew-ing. This suffers from the same problem as another locked room I read recently (Hoodwink by Bill Pronzini) in that the same small yet frankly huge piece of evidence is only mentioned for the very first time as a casual aside during the solution, and it kinda changes everything. These are puzzle plots, dammit; you don’t go overlooking that kind of detail, and I shall keelhaul the next author who pulls this kind of nonsense! I would love to be unhesitatingly enthusiastic about this, but these couple of points marred my enjoyment enough to drag it down a peg or two. The killer is superbly hidden (but then the method plays a part in that…) and anyone looking for a classical piece of crime fiction will be more than adequately gruntled by what is on display here, however. And, misgivings aside, I’d love to read more Wynne based on this, so here’s hoping the British Library have some more of his Hailey impossible crimes up their sleeves, and the physical object of these editions is so consistently produced to such a high standard that they’re a joy to read no matter what the contents. Given the deserved attention that this BL series has been getting you can find reviews of this all over the place, so there’s plenty of opportunity to seek out alternative perspectives – see Beyond Eden Rock, CrossExamingCrime, Desperate Reader, His Futile Preoccupations, In Search of the Classic Mystery Novel, and many others. However, special kudos must be given to TomCat at Beneath the Stains of Time and ‘Passing Tramp’ Curtis Evans who were both onto this before the British Library reprinted it – in this instance, as many others, they’re the cool kids on the back row of the bus and the rest of us are merely posturing so they’ll let us sit with them. I submit this review for the Golden Age Vintage Cover Scavenger Hunt at My Reader’s Block under the category A Country Scene. Thanks for the mention, JJ! I’ve only read three of Wynne’s mystery novels, but this was by far the best one. The Green Knife had an interesting explanation to a series of locked room stabbings, but the narrative and characterization was thickly tinged with the melodramatic nature from a previous era of sensationalist fiction. Overwrought even! I can barely remember anything about The Red Scar, but, glancing at my review from 2012, I found it (technically) to be the most accomplished mystery one of three. Thereby directly contradicting my claim how this was the best one. I guess it would make the book the most memorable one of the three. Well, let me end this mess of a comment by saying that I wish Wynne would have done more with the legend of “The Swimmers” and, hopefully, more reprints will follow. There seems to have been a short period, between 1930 and 32, when he wrote a handful of novels with colored titles: The Blue Vesuvius, The Yellow Crystal, The Silver Scale Mystery (Murder of a Lady), The Silver Arrow (The White Arrow), The Green Knife and The Case of the Red-Haired Girl (The Cotswold Case). After that, the colors were dropped from the book titles. By the way, The Red Scar is from 1928 and there two books between that one and The Blue Vesusvius. Thanks for the mention. Interesting review, though I wasn’t surprised that you were hot on locating the right clues and making the correct deductions. Being much less capable at solving the methods of impossible crimes I was probably more easily fooled, though unlike you I didn’t have any major issues with the characterisation. I am wondering though what you made of the choice of victims after the first one? I thought there was a bit of amusing originality there. I’m not sure I located all the right clues…and certainly not the one that wasn’t revealed until the very bloody end! I did enjoy the victim choice, yes; a nice touch, and the second death is set up in such a way as to invite an obvious wrong solution…that was very well done. Thanks for the review, and I think both of us had a similar reading experience: I also was very much looking forward to it, but felt underwhelmed for one or two reasons. Perhaps the anticipation was stoked by the gorgeous cover? I thought it had an interesting mystery, but I also felt that the solution had some rough edges. I don’t seem to recall feeling disgruntled with the way the clues were presented, but I certainly recalled feeling slightly credulous regarding the nature of the solution. And I wished more was made of the setting: surely a mystery set in such a dark and dank Scottish castle deserves a more foreboding sense of atmosphere. Yeah, you’re absolutely right – there’s a real lack of place (compare it so, say, The Case of the Constant Suicides which does impossible death in the Highlands far more successfully). It makes that choice of setting unusual, in that he’s selected a water-adjacent property for the Swimmers and failed to capitalise on that, and selected a large and spooky old house and failed to capitalise on that…I think you’ve hit another nail perfectly for me. I suspect the nail I hit most perfectly, though, would be our mutual appreciation of the beautiful covers! It seems like Miles Burton’s ‘Secret of High Eldersham’ will be released in a few months’ time, and the cover looks gorgeous… Makes me want to ignore economic common sense, and purchase a hard copy instead of a much cheaper Kindle edition. Seriously, the paperback editions are so beautifully produced and to such a high standard that I won’t even entertain the idea of getting any of these on Kindle – all 8 or nine that I have are ‘real’ books, and worth every penny. If the response to the rise of ebooks is to make tree booms more attractive objects so tat people want to own them, the British Library is doing it right! Hmm, do I have the stamina to be underwhelmed yet again this year? I’ll have to sit on that one for a while. Meanwhile, you have given me a tremendous idea for a television series about two chums who teach in the same school – one Maths, the other theatre – who form a detective agency and solve crimes. Their names form the name of the agency AND the series title: Jiggery/Pokery! Which one do you want to be? I want to be a cool kid in the back of the bus!! I don’t remember having read any Anthony Wynne, although what sometimes happens is that I start a book and think, “Oh, yeah, I dimly remember this from 40 years ago.” So I’ll have a look for this one to see if it strikes a chord. I liked this a lot even though I guessed the killer (there were a limited number of suspects after all) and I too was a bit suspect about the repeated success of the murder weapon (once it was finally revealed). At the conclusion of the book, I also decided I want to read more from the author. I liked his philosophical observations. It seems we’re all agreed: more Anthony Wynne, please! British Library, are you listening?! Have you seen how expensive some of the used copies are?? ?